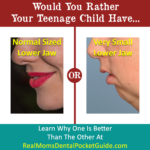 →Would You Rather Your Child Have A Very Small Lower Jaw Or Normal Sized Jaw? Genetics can be very strong for certain traits. What features commonly appear in your family? These are a few of the very commonly inherited features that run in families. That last one isn’t the only one that affects chins. Another strongly genetically-determined feature is the general size of the lower jaw. They vary from extremely undersized to very oversized. Personally, I love the variety of life among us humans. Think about the examples I’ve listed. If you don’t like your hair color, you can easily change its appearance. Don’t like your eye color? Contact lenses can mask that. Things can be done to modify skin color as well. 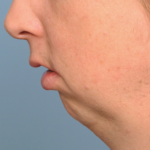 Dimples and cleft chins are a little bit more difficult, but their appearance can also be modified with surgery. Appearance is one thing, but what about function? None of the five examples I originally listed will drastically change the functionality of your life. But lower jaw size? That’s a whole different ball game. Your lower jaw is the only fused set of hinged bones (that basically function as one bone) that are controlled by nerves and muscles on both sides of the body. Think about it. Right and left limbs act independently. For the lower jaw, what the muscles on one side do can’t help but affect the other side. It’s a delicate balancing act. 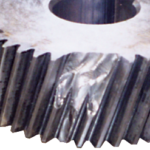 One of the many functions of the lower jaw is to be the moving piece that allows our teeth to work like gears or grinders. If things don’t fit together properly, either things get broken or there is a struggle to do any useful work. It’s true with teeth as well as gears. Look at these images and decide which you think would chew better. The point I’m trying to make is that lower jaw sizes vary a lot and it’s influenced by your inherited genes. If a small lower jaw runs in your family and it only affects appearance, then I say wear it loud and proud. Just like you can alter other genetic features, you can alter the size of your lower jaw. You might think I’m referring only to surgery. There’s far more to it than that, and it can be done with far less cost, risk, and intrusion. That’s what the visiting orthodontist wanted to show me. By doing some very simple, and very cost-effective things, wise dentists and orthodontists can alter how jaws grow. By these methods, teeth may be able to align themselves naturally so they not only look great, but also function as a team to do useful work (chewing, speaking, and stabilizing the jaw during swallowing). If you miss the opportunity during your child’s growing years, then surgery becomes the only option to alter jaw size. These are some of the ideas we discuss in Real Mom’s Dental Community. This is an online group where moms can ask questions specific to their child’s dental circumstances. Hey, we have a few dads in there too. Find the information you need to prevent your child having major dental disasters, such as a misaligned lower jaw that could possibly have been prevented. Watch this video to learn more.